During the Ming and Qing Dynasties, the shore of Guangdong in southern China suffered from pirate attacks. 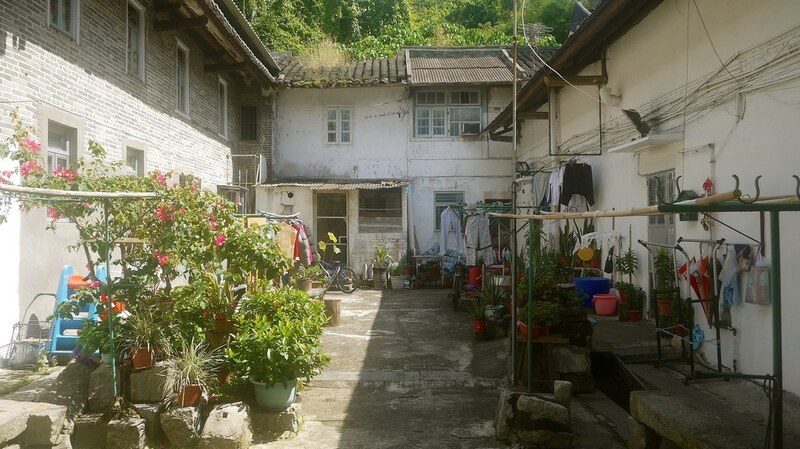 Locals built walled villages in order to defend themselves and of the few which have survived most can be found in the New Territories of Hong Kong. 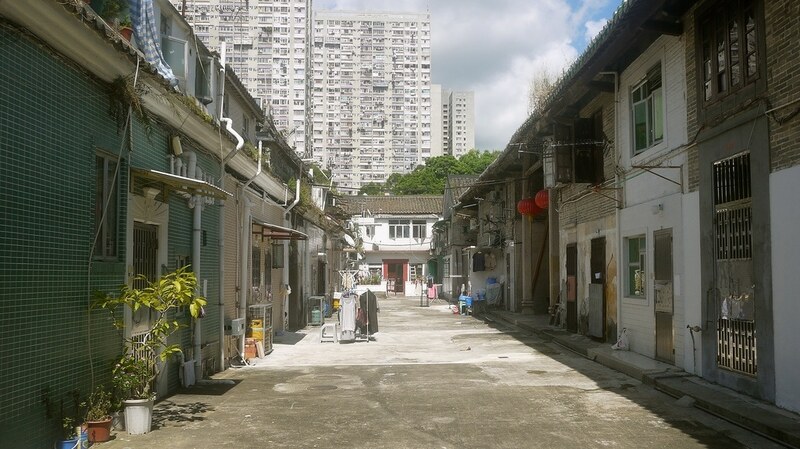 I recently spent an afternoon in Sha Tin District (沙田區) to explore some of their remains. 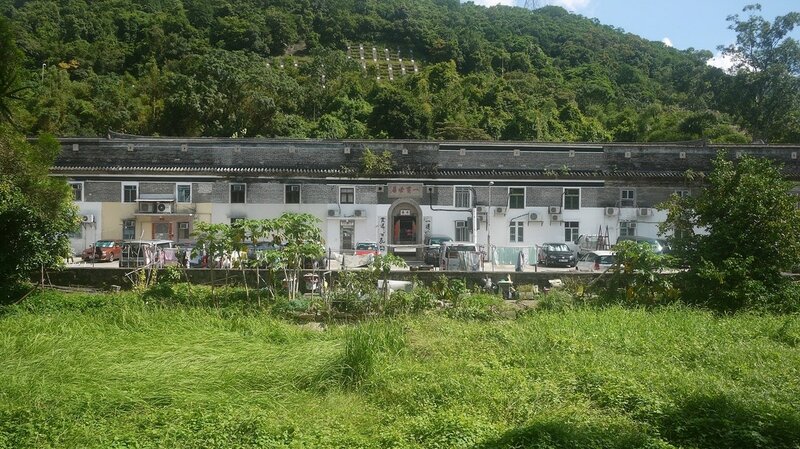 Tai Wai (大圍) occupies the southwestern end of the Sha Tin Valley and is the home of several walled villages, the oldest and nearest to the MTR station being Chik Chuen Wai, built in 1574. The original towers and walls have long been demolished leaving only the entrance gate and several old houses. 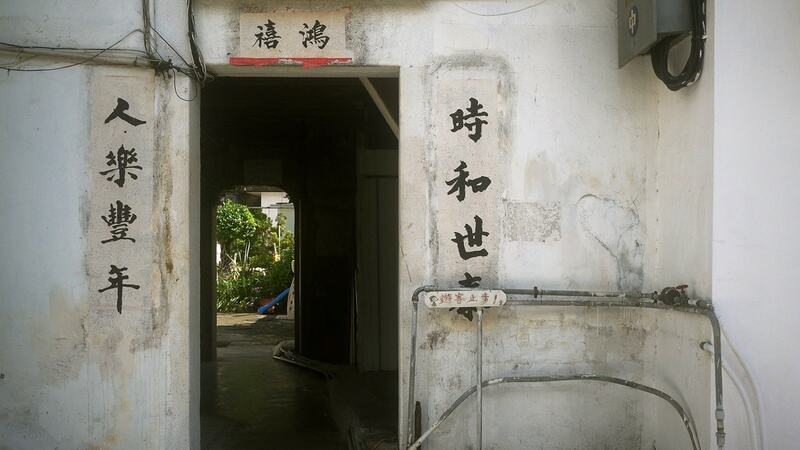 Even though the walls might be gone you can still find many villages with the word ‘wai’ (圍) in their name, meaning ‘walled’ in Cantonese. 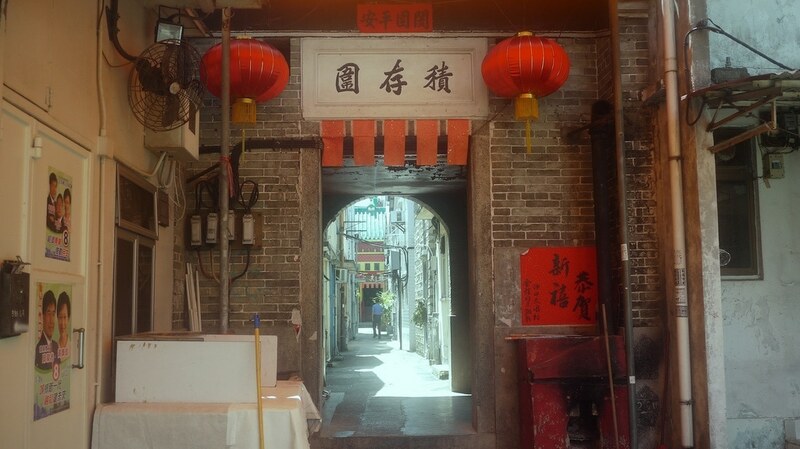 Like with most walled villages, the village temple is aligned directly with the gateway – its red and yellow facade can be seen at the end of the narrow street. 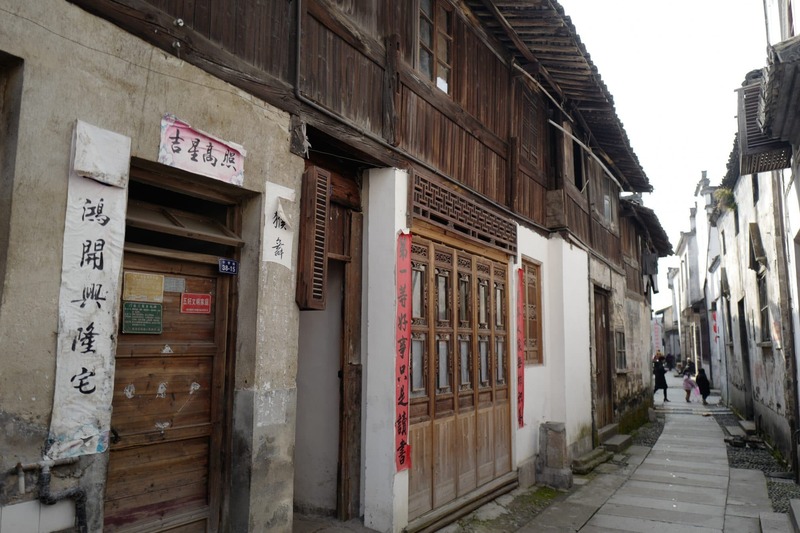 There are a few decrepit ancestral homes which looked unoccupied and overgrown with weeds but the intricate stone work and carved wooden beams provided hints of their former grandeur. In the background you can see the ginormous Festival City (名城) apartments – each standing 50 stories high and containing over 4,000 flats. How times have changed. 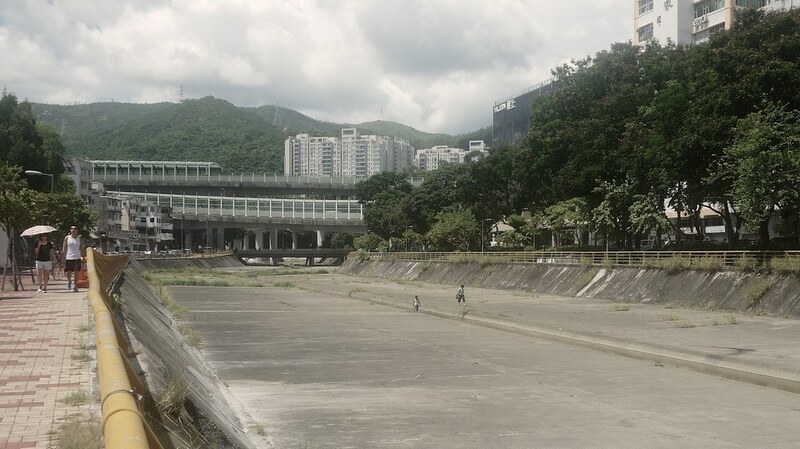 Walking east from the village you soon reach the tail end of the Shing Mun River (城門河) which is entirely dried up at this time of year and looks rather forlorn. 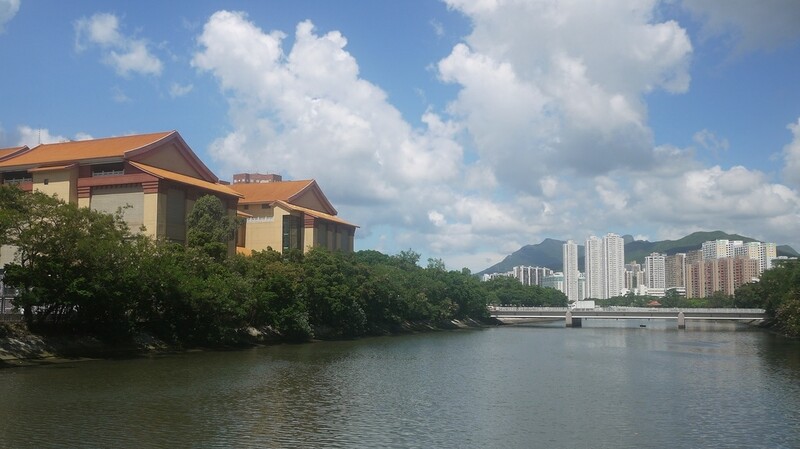 If you follow the path further along the north bank of the river the water eventually starts flowing and you’ll end up at the Hong Kong Heritage Museum which can only be described as an ugly monstrosity that looks totally out-of-place in its surroundings. 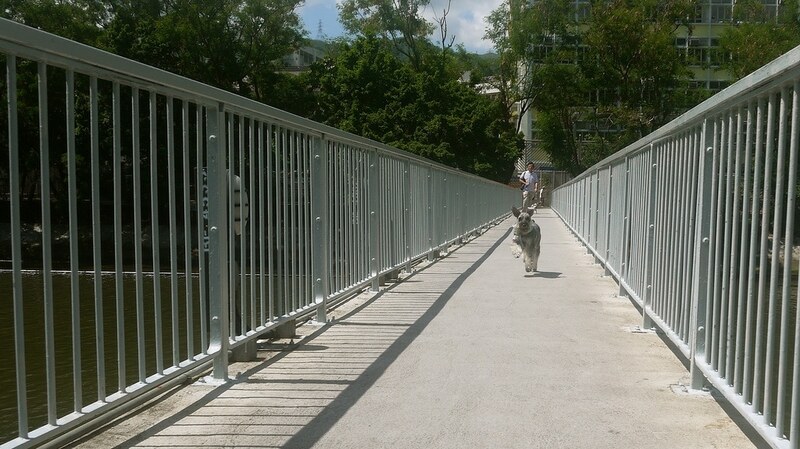 As I walked across the pedestrian bridge which links the museum to Che Kung Temple MTR station I was chased by a furry four-legged friend! 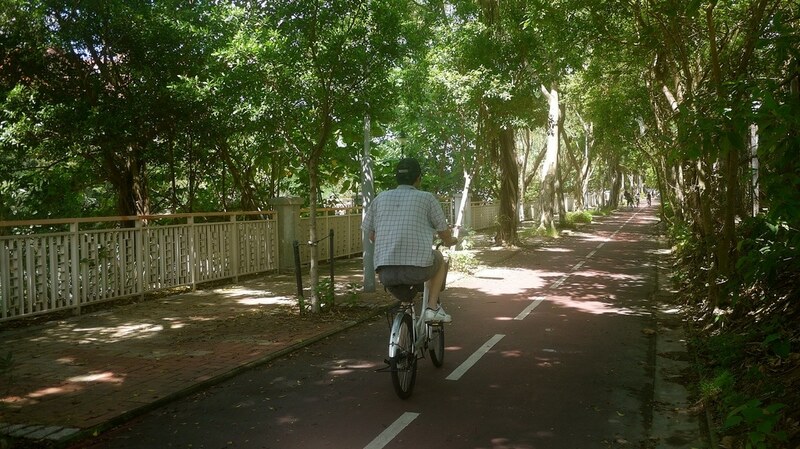 Beside the river cycle paths run below avenues of trees making it really nice for an afternoon out during the hot and humid summer weather here. 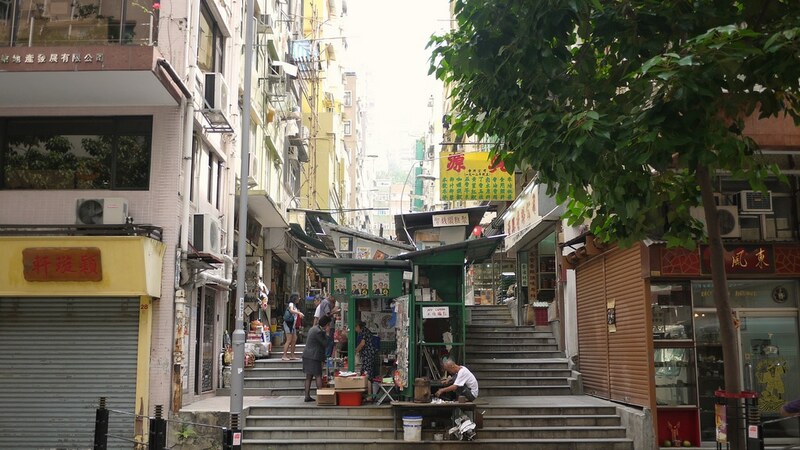 To the south of the MTR station lies the small village of Sha Tin Tau which is now squashed between the Lion Rock Tunnel road and a high-rise housing estate. 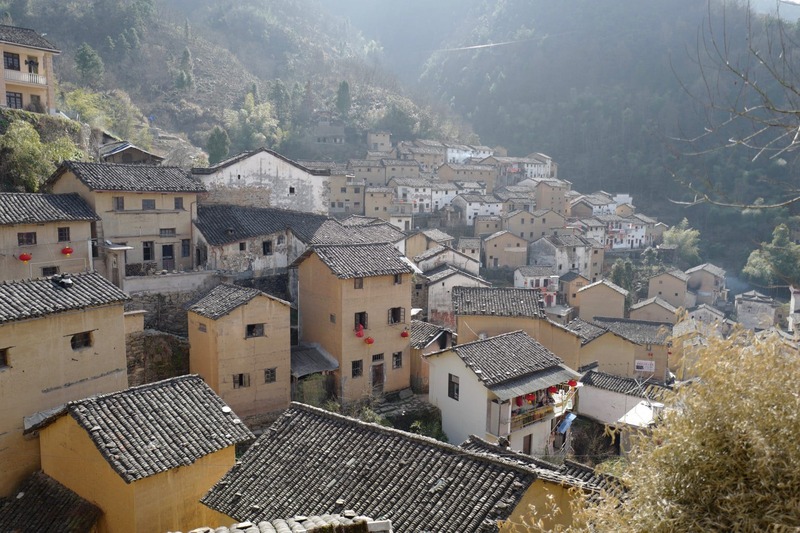 It’s not a walled village but interesting in its own right. 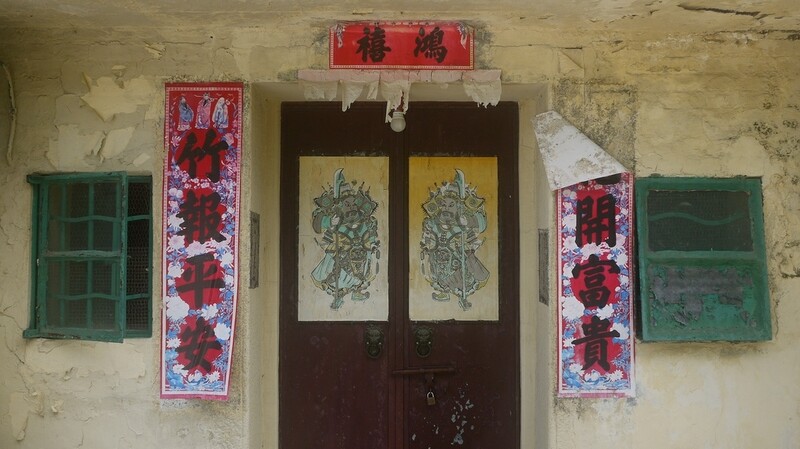 I like the way in China people put good luck banners (top – 横批, sides – 对联) around their doorways at Chinese New Year and then usually leave them up till the following year. 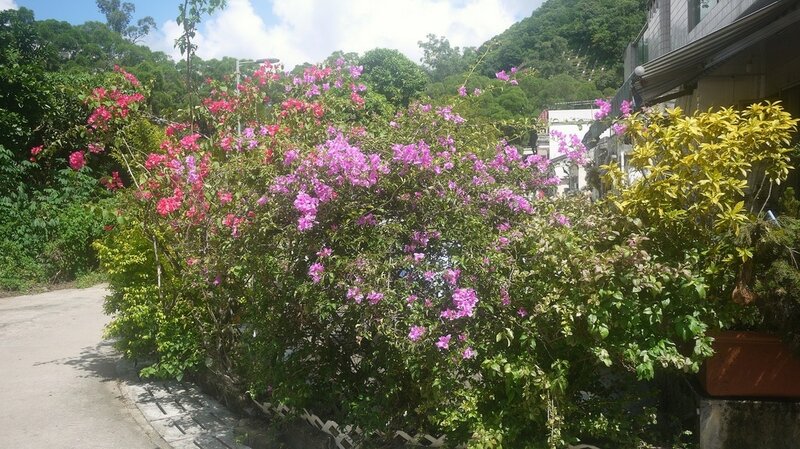 On the other side of the Lion Rock Tunnel road is Tsang Tai Uk (“Big House of the Tsangs”), also known as Shan Ha Wai (“Walled Village at the Mountain’s Foot”). 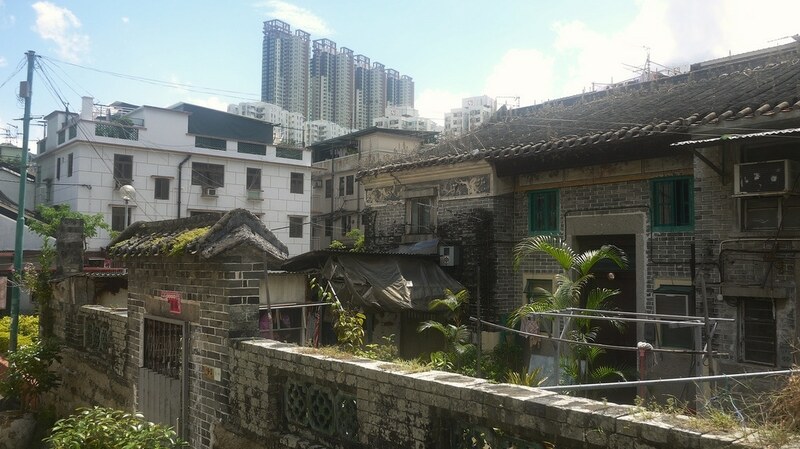 Built in the 1840s, by the wealthy granite merchant and stonemason Tsang Koon-Man as a stronghold for the Tsang Clan, it is one of the best preserved Hakka walled villages in Hong Kong. The village complex is rectangular and consists of three rows of houses enclosed by grey brick and granite walls with solid timber beams. The four corners each feature a three-story guard tower with openings in the wall through which guns could be fired back in the early days of the complex’s role as a defensive fortification. There are three-arched entrances in the northern wall. 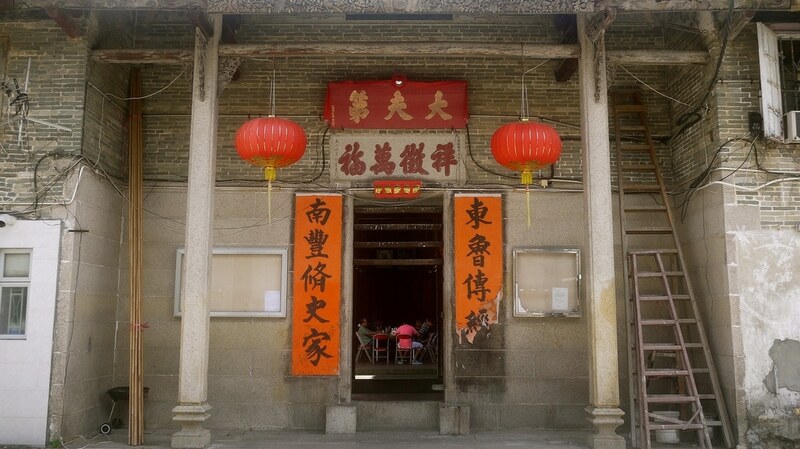 The main or ceremonial entrance is in the middle and leads to the ancestral hall where meetings and ceremonies take place. 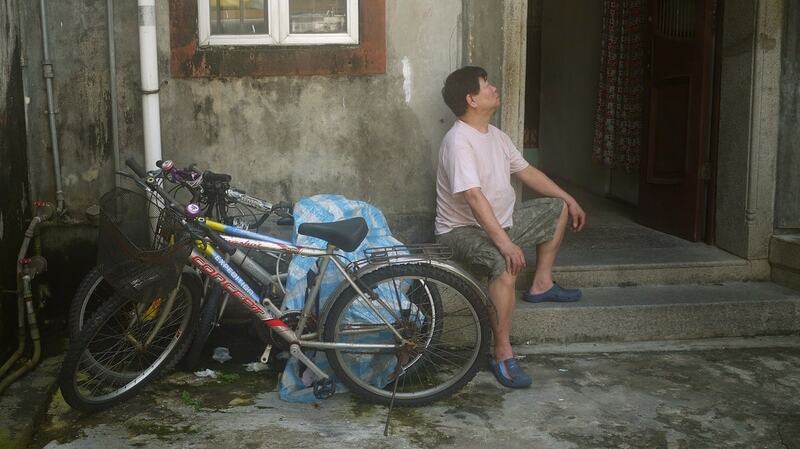 While I was there the village elders were in the middle of a discussion so I didn’t go inside. In front of the main building is a long courtyard, where villagers traditionally dried their harvest but today only dry their clothes! 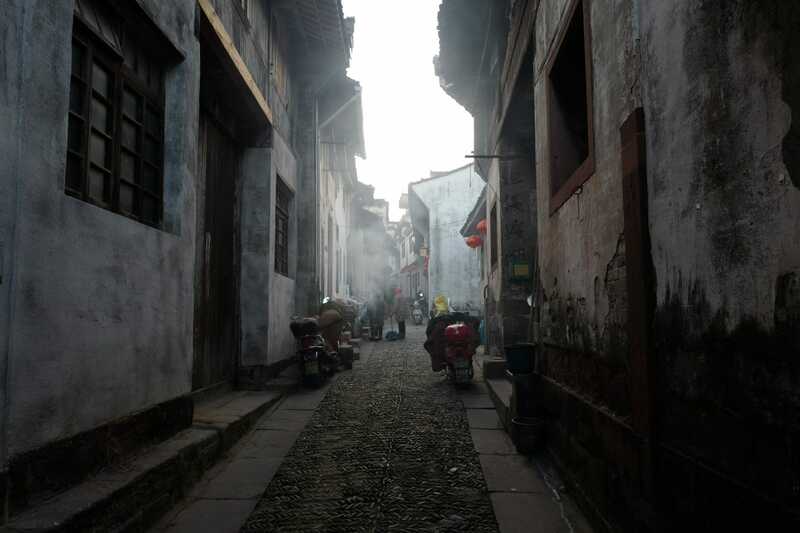 All the houses are interlinked by passages and small courtyards. 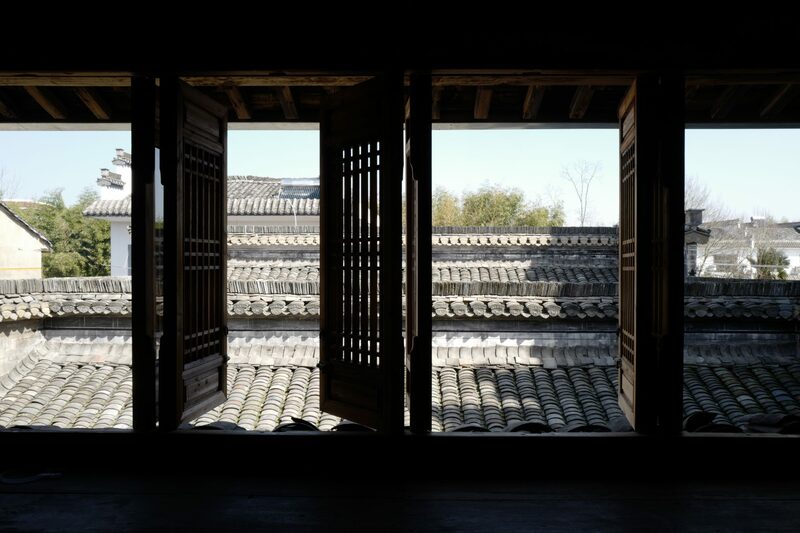 Visitors are permitted in the first courtyard (above) and ancestral hall; the remaining courtyards and buildings are private. 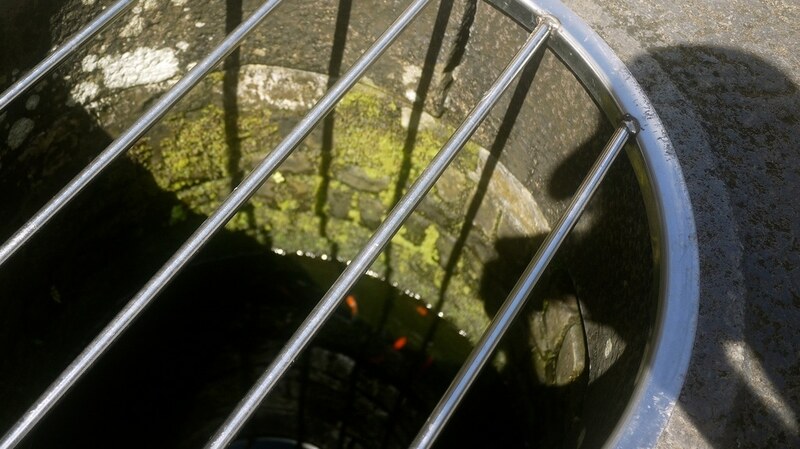 There are two wells, one at either end of the main courtyard, used in order to provide drinking water in times of siege but by the looks of the goldfish swimming in them I don’t think they’re in active use today. 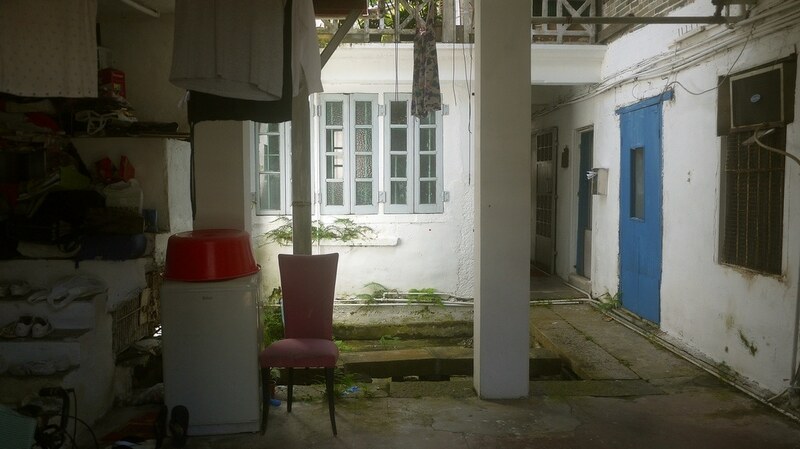 I wish I could have explored further inside the compound – it’s like being in a world time forgot. 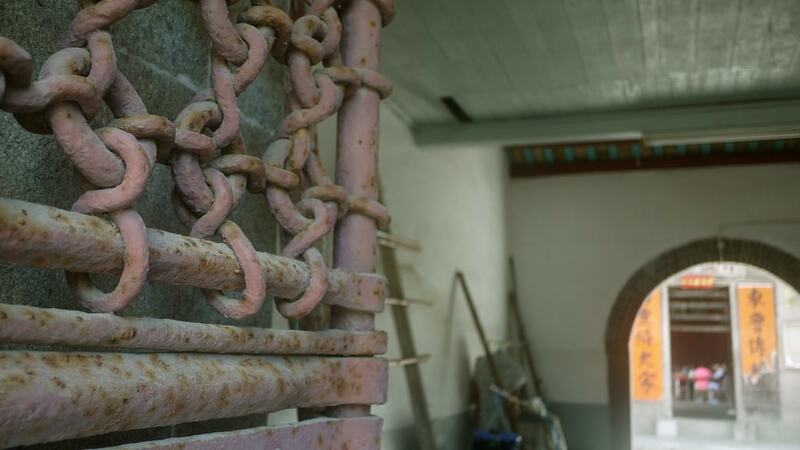 Although these are historic building they are still in everyday use by their inhabitants, many of whom are descendants of the original clan. 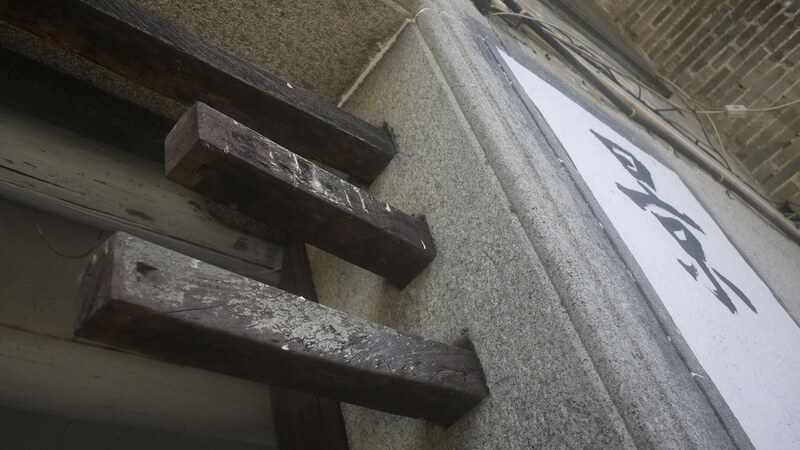 Some of the stone doorways feature square holes cut into each side through which wooden bars can be slid across to close them. Although now empty it looks like some of the courtyards contained shallow pools which must have provided a very tranquil environment in its heyday. 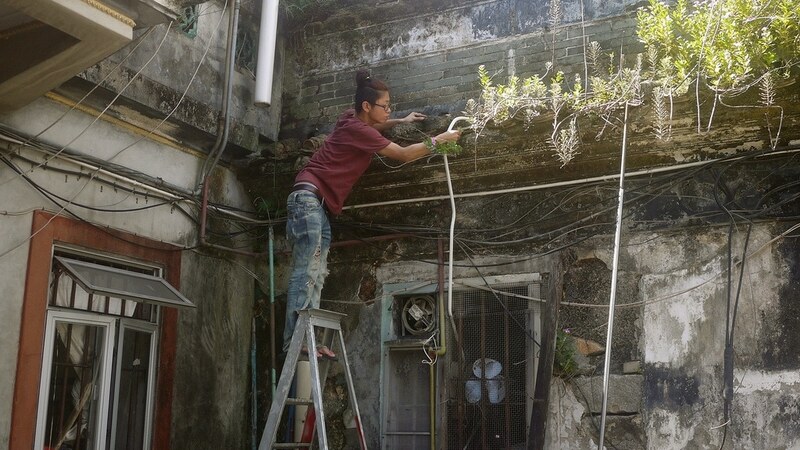 The buildings are in a fairly poor state of repair and clearly in need of constant maintenance – here a man was removing overgrown plants from the wall. 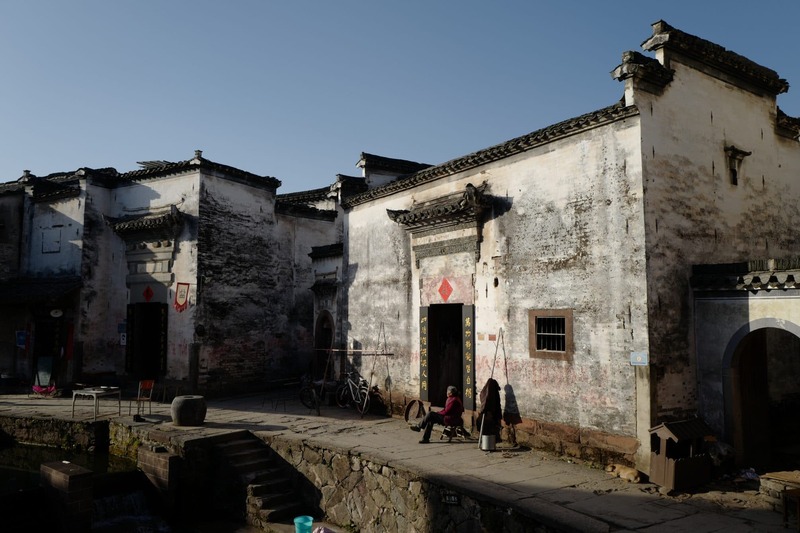 Given that all the properties are privately owned it’s up to the villagers to handle preservation but a lot of recent renovations do not look very sympathetic. 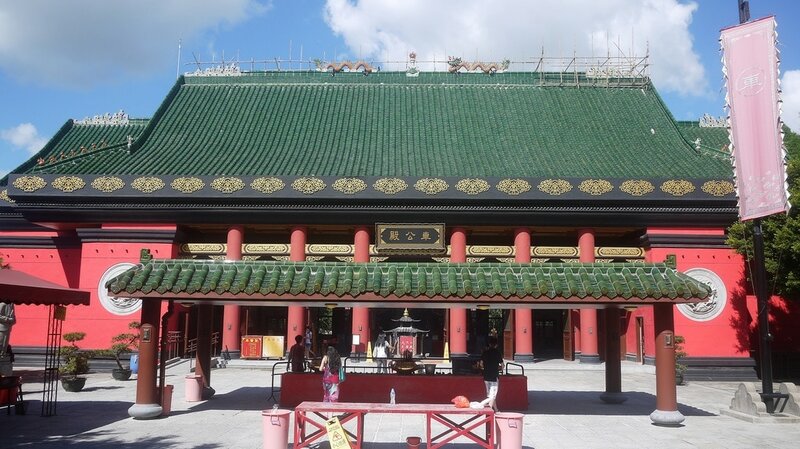 On my way back to the MTR station I popped inside Che Kung Temple (車公廟) which was built in 1993 and not terribly noteworthy. 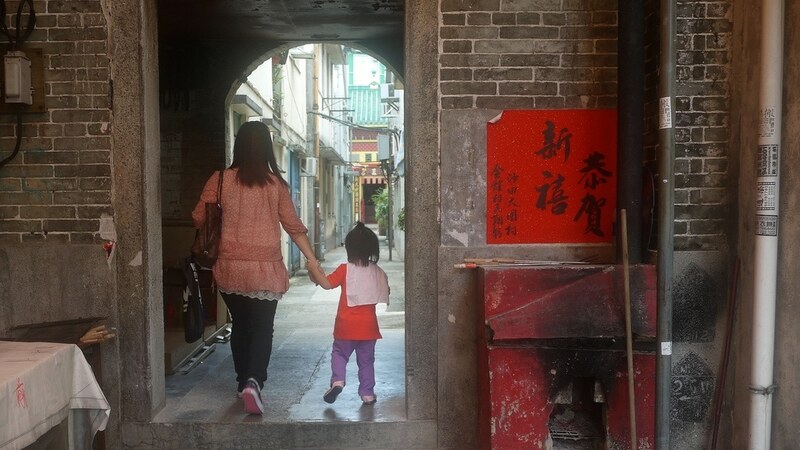 If you’re interested in this sort of history you may also like to check out Nga Chin Wai Walled Village near Kowloon Walled City and the amazing watchtowers in Kaiping near Guangzhou in mainland China. 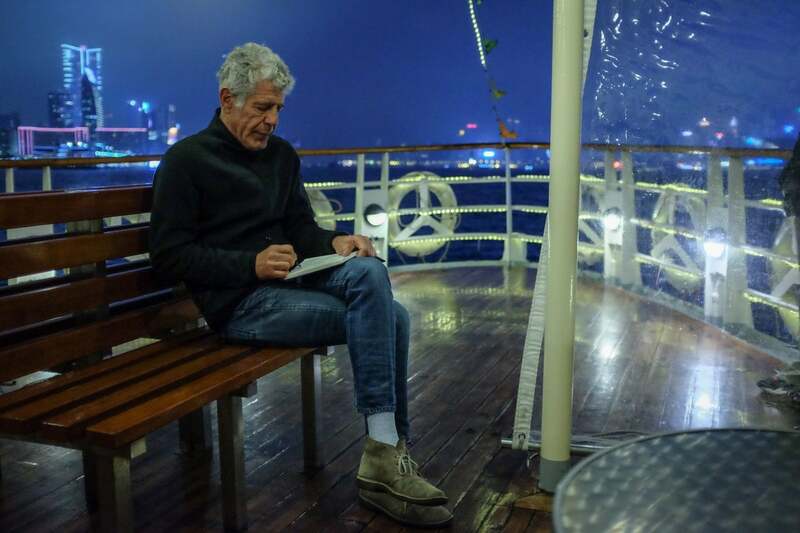 Thank you for this great photo walk, David. I loved the over-grown abandoned houses. To think that this is just a short train ride from the most densely populated district in the world…! 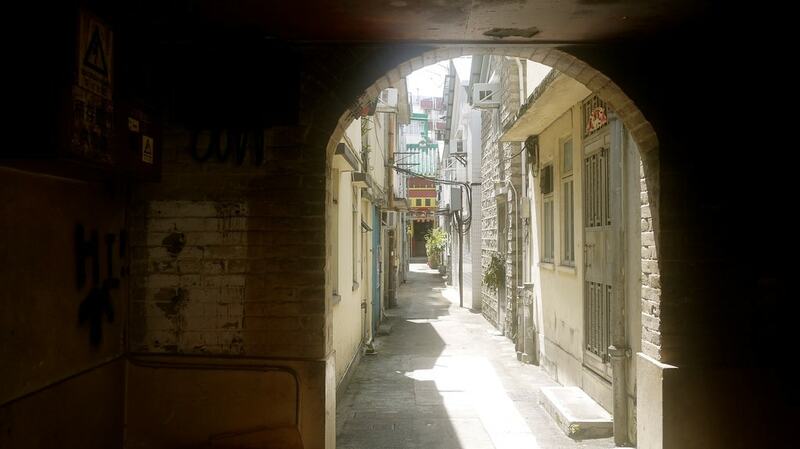 I will Definitely love to visit these places when I come to HK next.